The Brogan brothers and Alan's son Jamie celebrate Dublin's victory. BERNARD AND ALAN Brogan matched their father Bernard Senior yesterday by landing a third All-Ireland senior football title with Dublin. But the family affair was made more special by their father being present to witness their success despite a recent period spent in hospital. “My dad hadn’t been well at all during the week,” revealed Bernard after the match. “The knees of a footballer back in the 70′s, his legs have been blown up and he was struggling during the week. Like always, he just wished us well. “That gave us a lot of solace, looking at him and the battles he’s gone through during the week. He was in and out of hospital with joint pain. “I’m sure he’s a very proud man up there, up in the ESB box there with my uncle Ollie. I’m delighted that he could make it in because I was worried during the week that he’d have to stay in hospital. There had been plenty doubt about Alan’s inter-county future in the opening months of 2015 but he returned to the panel before the start of the championship. And when sprung from the bench late on yesterday, he clipped over the insurance point to ensure that All-Ireland medals were coming back to the Brogan family and Sam Maguire would be lifted by Stephen Cluxton. “That’s all you want to see, have Alan come on and try and settle the ship. He always does that but he actually went and drove at it which is probably what they didn’t expect. “He kicked a great score, so delighted for him. My dad has three and I’m delighted to be able to match him. He doesn’t have the bragging rights in the house any more. Brogan also outlined his belief that Dublin absorbed lessons from their two-game saga against Mayo. “The second Mayo game we learned a lot. The first game, we were over excited and over exuberant, jumping around and indisciplined and moving frees forward and fouling lads. 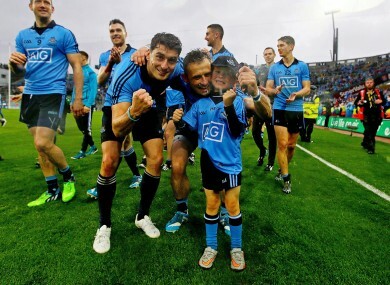 Email “Bernard Brogan got out of hospital in time to see his sons win an All-Ireland for Dublin”. Feedback on “Bernard Brogan got out of hospital in time to see his sons win an All-Ireland for Dublin”.